Last month the Animal Hope and Wellness Foundation hosted A Dog’s Night at North Hollywood’s Federal Bar. Guests enjoyed a night of vegan appetizers, drinks, and live entertainment. Hosted by Kemble and Jen Walters, guests could participate in a silent auction to help raise money for the foundation. Auction items varied from gift cards to exclusive television set tours. All ticket and auction proceeds went directly to the foundation’s animal rehabilitation services. The Animal Hope and Wellness Foundation (AHWF) helps rescue abused and neglected animals, providing full rehabilitation services, and working to help find them new homes. The foundation has recently been focused on rescuing dogs from the Asian Dog Meat Trade. Founder and CEO Marc Ching has made countless trips overseas to videotape and document evidence of the brutalities and torture of live dogs before they are slaughtered for human consumption. Ching has saved thousands of dogs, even going as far as risking his own life to smuggle them out of the slaughterhouses. By raising awareness, Ching and the AHWF team expose these barbaric rituals in order to enact change and force the government to create laws to protect these animals. Ching continues to fight for these dogs and to help the dog farm owners find new occupations. AHWF has a few upcoming fundraiser EVENTS in March. VOLUNTEERS are always more than welcome to stop by the foundation's headquarters in Sherman Oaks, California to help with the dogs. Looking to ADOPT? Look no further than an AHWF rescue pup! Please READ the adoption process on the website. 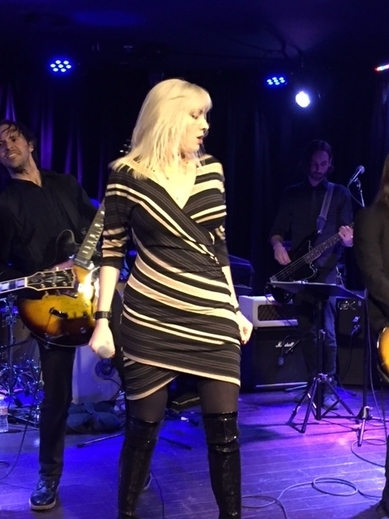 Surprise musical guests joined onstage were Noodles (The Offspring), Kevin Martin (Candlebox), Mark Schulman (PINK), Brett Scallions (Fuel), Abby Gennet (Slunt), and Sean and Juliette Beavan (8MM).